Urban Horse Promotes an Easyboot RX Therapy Hoof Boot from Easycare. 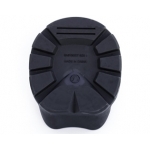 Easyboots Are Tough Wearing and Exceptional Value For Money. Helping Bring a Quick Recovery Back to Your Horse or Pony! Easyboot RX features are as follows - See Additional Images! Lightweight, soft and flexible boot to aid recovery or help treat hoof or leg conditions. Three air vents provide air circulation while preventing the accumulation of dirt and debris. Top of the boot opens right up to allow easy access for the hoof. Fitted with an Easycare comfort pad. Suitable for: Most leg or hoof conditions, controlled light turnout. The Easyboot RX launched in 2009 is just the prescription for horses requiring a therapy boot that offers stability and support without being heavy or clunky. The RX helps horses to heal and recover quickly, and is used by Vets, hoof care professionals and horse owners to offer support and relief for horses suffering from problems including chronic lameness, laminitis, founder, navicular and other lower limb/ hoof problems. The Easyboot RX is the ideal option for horses that simply have trouble standing on hard surfaces for extended periods for time. The RX can also be used to speed recovery and offer protection after surgery or injury as well as to lessen fatigue and add protection during travelling or breeding. The sole of the Easyboot RX is a combination of durable and soft material, similar to that used in human orthotics, all in a lightweight package. All the seams and edges on the RX have been rounded for safety and three air vents provide circulation, helping to keep the hoof cool whilst preventing the accumulation of dirt and debris. Application is quick and easy as the unique upper of the Easyboot RX folds down and opens up large enough to accommodate the wide base of a hoof. No force or strength is required to apply or remove the boot, and the fastening system is a simple yet secure double lock hook and loop fastening system.